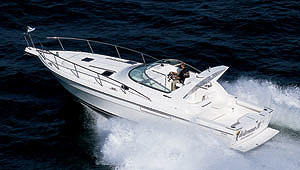 Campion Allante LS 645 is swift enough to stop life from passing you by. Getting older changes you. Weeks begin to pass like days, and years pass like months. Therefore, we're always on the lookout for those memorable experiences that somehow manage to slow things down for just a moment, even if the respite can only last for so long. Our test of the Campion Allante LS 645 was one such memorable experience. 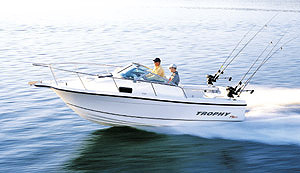 It's funny how it can take a fast boat to slow our lives down to an enjoyable speed. We had the pleasure of testing the Campion Allante LS 645 up north — way up north — in Kelowna, British Columbia. It was a clear, sunny day, and the 10-knot winds had kicked up about a foot of chop. 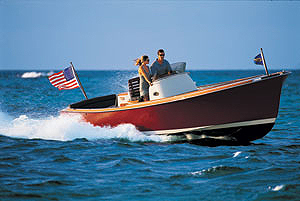 Our test boat was equipped with a 320 hp Volvo Penta 5.7 GXi DP stern drive. 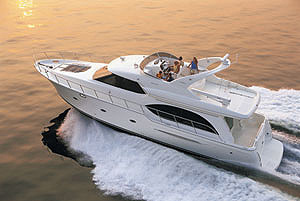 The boat is rated to handle up to 320 hp, so this engine is the most powerful package available. We knew we were in for one heck of a ride. Sure enough, we threw the throttle forward, and the boat reached plane in a swift 4 seconds. Specifically, the 645 hit plane at 18.4 mph (2,300 rpm). Still gaining speed, the 645 whipped across the water in a line as straight as a razor's edge. We were able to hit a top speed of 54.4 mph, which is remarkably close to Campion's listed speed of 55 mph. The engine did hesitate when we threw it from idle to wide-open throttle, but after that small hiccup, the boat went to work and gained speed quickly. 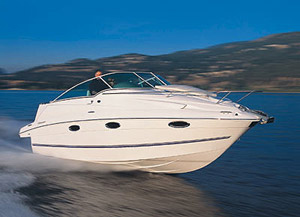 Cruising speed is 36.3 mph, at which the boat gets 3.5 mpg. The 645's low bow style provided good visibility forward during all maneuvers. The boat was a bit loose on turns when we had it trimmed way up, but that was easily corrected by trimming down several degrees. 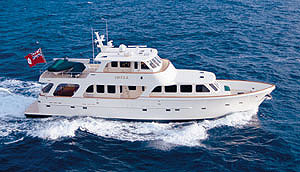 With its 19-degree deadrise, the boat's overall ride was very comfortable. Snap-in carpeting on the deck contributes to a very quiet ride while at speed, so we had no trouble carrying on normal conversation. Campion offers excellent fit and finish on all of its models, and the company's gelcoat is particularly impressive. We give the gelcoat work a solid 10, and the tooling work, which affects the fairness and smoothness of the fiberglass parts, is terrific. The boat's APEX hull has Kevlar laminate reinforcement, and there is a fiberglass cockpit liner and wakeboard tower reinforcement. The requisite anchor locker sits at the tip of the bow. Up front, the layout is exactly what you would expect of a bowrider this size. The bow seating area can easily seat three adults, and the cushions are hinged to provide effortless access to storage under the seats and behind the backrests. A bow filler cushion is available as an option. At the center of the 645 you'll find a wrap-around windshield, which offers protection to the port and starboard consoles. The port console features a glove box and additional storage; the starboard console serves as the helm station. Both the driver and the passenger get bucket seats, but only the captain's seat includes a flip-up bolster (although a bolster is available as an option for the passenger's seat). 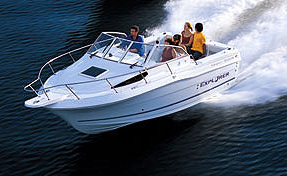 An in-dash depth sounder is standard, as is tilt steering, an automatic bilge pump, a remote oil filter and halogen docking lights. 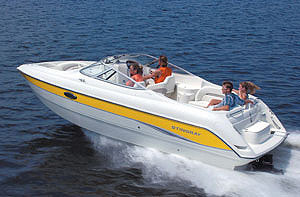 The cockpit's other features include a portable cooler, a large ski locker in the deck, courtesy lights and a premium Clarion weatherproof AM/FM stereo CD system with four speakers. If you choose the optional Entertainment Power Package, you get two more speakers, plus an amplifier, a subwoofer and a remote. A U-shaped settee outlines the rear section of the cabin — but the settee's port corner seat can be removed to provide step access to the transom. The integrated extended swim platform that adorns the very back of the 645 sports a built-in three-step telescoping swim ladder made of stainless steel. The rear-entry stern storage lockers are big enough to hold fenders, wakeboards and other essentials. A portable cooler is standard in the cockpit. The boat's heavy-duty rub rail comes with stainless steel inserts, and all of the boat's deck hardware is made of stainless steel. There's even a stainless steel ski tow eye. A transom shower is available as an option, as are rear halogen docking lights, a dual battery switch, freshwater cooling, a cockpit table with filler cushions, an acrylic cockpit cover (over the windshield), a trailering cover and flush-mounted stainless steel pull-out cleats. A canvas is standard but can be deleted from the package if you wish. The 645 can seat up to seven people in the cockpit, so you should have plenty of room for the family. Grab onto an excellent boat like the Campion Allante LS 645 while you can, because the days are only going to get faster from here. In-dash depth sounder, tilt steering, automatic bilge pump, remote oil filter, halogen docking lights, portable cooler, large ski locker in the deck, courtesy lights, premium Clarion weatherproof AM/FM stereo CD system with four speakers. Transom shower, rear halogen docking lights, dual battery switch, freshwater cooling, cockpit table with filler cushions, acrylic cockpit cover (over windshield), trailering cover, flush-mounted stainless steel pull-out cleats, Entertainment Power Package.